The third and final stage in information flow to control the model. This is where the channel centre, limits (to prevent servo binding) and servo direction are set. There are 32 output lines. At this stage a channel receives the output from a mix and scales the percentage values to microsecond pulse widths. This assumes a 512μs minimum and maximum limit. The mix percent value is processed by multiplying it with the travel limit in microseconds and then adding the PPM centre and subtrim values in microseconds. This is optionally used as an input to a curve to produce the final output. This final output will always be within the set minimum and maximum travel limits. A channel without a mix centre’s it value to 0% ⇒ 1500μs. Channel Monitor: The output from the selected line. Channel Name: The channel name will also be displayed on the mixer screen. On larger screens it also displays on the failsafe and channel monitor screens. Channel Number: The channel number is displayed if no name is configured on smaller screens. 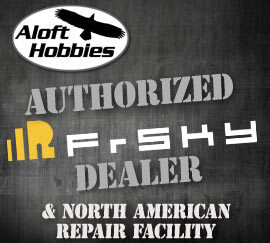 Always displays on larger screens. Subtrim: The channel offset from its configured centre value. Min/Lower & Max/Upper Limits: Servo travel limits in percent or microseconds. Center Value Microseconds: The servo centre pulse width in microseconds. Default/Asymmetrical – travel limit same on one side, shortened on the other side, preserve curve. There is a region where when the servo does not move when the stick moves. Symmetrical – travel limits stay the same, curve changes. The servo always moves when the stick moves. Edit: On the Taranis Q X7 to edit the settings. Copy trims to subtrims: The trim offset from the sticks is coped to the subtrim. Copy sticks to subtrim: The stick position % gets copied to the subtrim. The channel name will be displayed on the outputs screen and also on the mixer screen. On larger screens it also displays on the failsafe and channel monitor screens. The subtrim setting is an offset similar to trim. When the source is centred the servo will be at the PPM centre value plus this subtrim value. Center or align the control surfaces on the bench. Give back travel range to the trims. Usual trim range is 25% of the stick range. Preserve trim settings between model changes. This is a way to ensure that the model always has the correct trim when loaded. 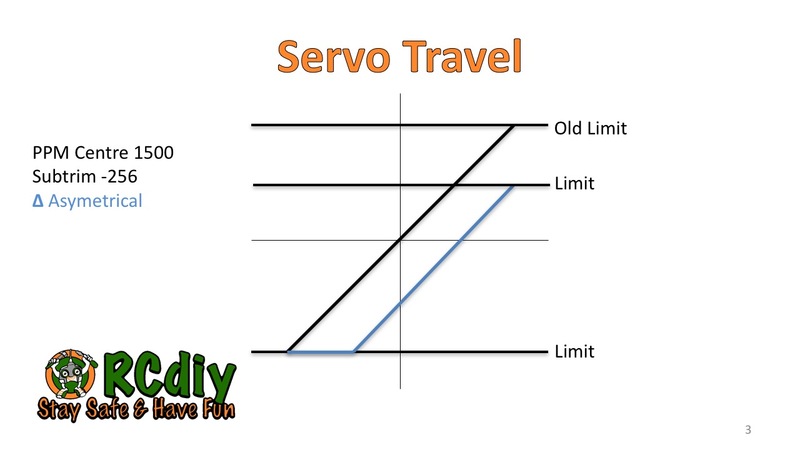 The lower limit for the servo travel with respect to the PPM centre value. Set the channel source/input to minimum, -100%, and then watch the servo. Adjust this limit till the servo no longer gets stuck or the maximum desired travel is reached. The upper limit for the servo travel with respect to the PPM centre value. Set the channel source/input to maximum,100%, and then watch the servo. Adjust this limit till the servo no longer gets stuck or the maximum desired travel is reached. The direction of the servo is reversed if INV is selected. A custom curve or an inverse of a custom curve may be selected. Similar to subtrim with the difference being that the minimum and maximum limits change when the centre changes. Limits are with respect to the centre. The trim offset is coped to the sub trim. The trim gets reset to zero. Read the explanation of subtrim above for more information. Select this row and Press ENTER. Servos are made to centre their movement at a particular pulse width setting. Most RC servos centre at 1500 microseconds. The limits are the maximum amount of movement either side of the servo’s centre position. In OpenTX, with default settings, the maximum limit of 100% equates to 512 microseconds. When the centre value is changed the limits change. In the default asymmetrical subtrim the limit on one side gets shortened by the subtrim amount. While the limit on the other side stays the same. The curve as configured in the inputs and mix stages is preserved. If a stick is being moved, on one side of centre, the servo stops moving before the stick stops moving. In the symmetrical subtrim the limit both sides stay the same. The servo travels to both the limits as it did before the subtrim was set to a non-zero value. The curve as configured in the inputs and mix stages is now modified to scale with the preserved limits but changed centre. If a stick is being moved the stick and servo stop moving together.